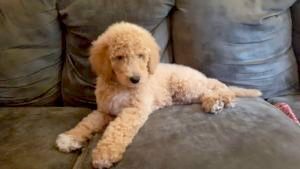 Additional Notes: Rosie is a standard poodle with a wheat colored coat. She has white patches on her chest and paws. Her fur is shaggy. Rosie is shy of strangers but loves children, other dogs and cats. Last seen in our yard.